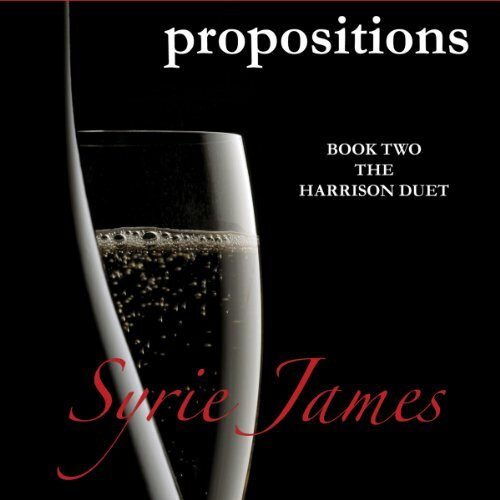 Holly Fielding's alluring, silky smooth performance of Syrie James' Propositions elevates the sexual tension that exists the moment freelance advertising artist Kelli Ann Harrison meets the handsome and successful San Francisco ad exec Grant Pembroke at a mixer in Lake Tahoe. As they begin work on a project together, their mutual attraction is undeniable, but separating business and pleasure proves to be more difficult than either could've imagined. Listeners will be immediately entranced by Fielding's vibrant portrayal of Kelli and Grant's white-hot romance. When freelance advertising artist Kelli Ann Harrison agrees to oversee the final phase of construction on her brother's glamorous Lake Tahoe house, she intends to make a holiday out of it: lend her brother a helping hand and at the same time enjoy the area's winter sports. An unexpected encounter at a holiday mixer, however, leads to a job offer that throws Kelli's plans into disarray. Grant Pembroke, founder of Pembroke Advertising, is in town to bid for the lucrative Cassera's Casino account. Impressed by Kelli's artistic vision, Grant makes her a proposition that's too exciting to refuse: team up with him to forge an ad campaign for the bid. Kelli is determined to keep things professional, but that won't be easy, considering the high-voltage charge that sizzles between them from the start. With his creative ingenuity and broad-shouldered, dark-haired good looks, Grant makes it very difficult for Kelli to concentrate on her work - especially when it becomes clear that his feelings for her go far beyond the workplace. They make a wonderful team. But Grant is as headstrong as he is talented, and at times the two of them clash. Can business and pleasure mix? If Kelli and Grant play their cards right, can a whirlwind love affair last forever? ©1987 Syrie Astrahan James (P)2013 Audible, Inc.